I am loosing patience with Palm! The Palm Pre is first and foremost a cellular phone. (That’s why you commit to a 2-year plan with Sprint!) Various states ban/restrict the use of cellphones while driving unless they are operated through a hands-free device. Such devices require Bluetooth to operate. * Nissan & Infinti‘s Built-in Bluetooth Hands-free Systems are not compatible with the Palm Pre. The Pre will sync but the connection is full of static and will eventually drop the call. * Similar problems have been reported with various models from Acura, BMW, Ford, GMC and Mazda. * Bluetooth headsets by BlueAnt, Jawbone and Motorala have problems syncing and pairing. * Stereo Headphones like Motorola Rokr S9, Altec Lansing Backbeat 903 and Sony Ericsson HBH-IS800/ HBH-DS980 have choppy playback and weak connections which fail outdoors. Call Palm’s Technical Support line at 1(866)750-7256 and ask for a “Level 2 Specialist” and file a complaint. 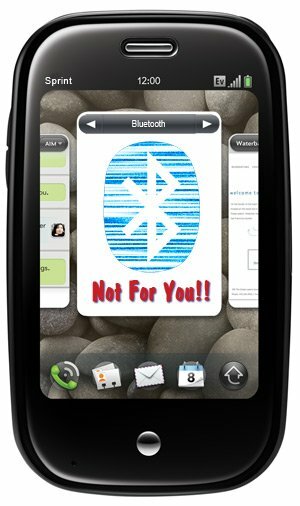 Create new threads on the Palm Forum about all Bluetooth problems! Talk about it on blogs, Facebook, Myspace & Twitter … anywhere and everywhere! The louder we get, the faster Palm will acknowledge the problem and fix it!! I have owned palm pre for 3 weeks. It does sync with my acura RL.However, when i make a phone call the call goes through but the sound does not transfer to the car stereo system, and stays on the pre handset. Please post your problem on the Palm Forum here. This thread is over 8 pages long! Palm is monitoring this thread and collecting all of the posted problems. Palm/Sprint held off on releasing this update which was scheduled for 9/8 probably in response to Apple disabling the iTunes sync again. But, the update is still expected sometime this month. I have an Acura TL 2005. When I use my Palm Pre it bypasses the car stereo system and goes to the headset. Last week while driving and charging my Palm Pre a call came in which went through the car stereo. Weird? Could having it plugged in have some effect? I have seen that too. It is a programming bug. There are several sources indicating that the WebOS 1.2 update will be released on Sept. 24, 2009. This should bring an update to the Pre’s Bluetooth as well as fix the sync with iTunes 9.
i just purchased the palm pre 4 days ago…this is the first phone that i’ve ever had that is’nt fully bluetooth compatible. for all of the pre’s attributes i cant believe that it won,t send contacts or even pictures via bluetooth. i hope that palm can fix this problem within the next few weeks because i would hate to have to return this phone and cancell sprint’s rediculously expensive service. Well, the next update is scheduled for 9/24. It should include a bluetooth update as well as an update to the App store to allow for paid apps (which will greatly increase the reason for company to create apps for the Pre). As far as the data plan, Sprint is the cheapest plan compared to AT&T and Verizon. Add in the fact that it now also includes unlimited mobile-to-mobile calling for ALL carriers, and it makes Sprint a real bargain! I have had my Pre for about a week now, and I too am suffering from these frustrating bluetooth issues with my 2009 Nissan Murano. At first, I thought it was my car and now feel vindicated that its not just me. I’ve owned Palm products for years, and have owned just about every release of the Treo since the 300. I can’t believe Palm would not have a fully tested and functioning version of its bluetooth software when the product was released. This was their opportunity to compete with Blackberry and iPhones. Looks like they missed the mark….again. I hope your release date for the functioning version of the O/S is correct. I’m not suure how much longer my patience is going to hold out. If you jump to the 13-page thread on the Palm Support site you will see we are NOT alone! The WebOS 1.2 update is still on for tomorrow. Keep your fingers crossed! I drive an infiniti g 35 and the bluetooth works for the most part. The problem is whenever I turn my car off and try to use my pre, it stays in bluetooth mode and I can’t hear anything through the ear piece. The phone will complete calls but I can’t talk to or hear whomever I call. Fix this palm… And all the other bugs that shoul have been worked out before you sold me this thing for 300 bucks. I have seen that too occasionally. When that happens, you can switch “speakers” even in the middle of a call. Just click the speaker button and a menu will pop-up showing handset, speaker and bluetooth icons. You can change speakers on the fly. Make sure you visit the Palm Forum to document your problems there. Palm is really reviewing the problems and attempting to resolve them. I have the updated webOS 1.3.1 ad the bluetooth still does’t work. Thankfully, I my situation has been resolved. If you are still having a problem, you must post it on the Palm Forum for the moderators to document. I’ve had my Pre for a couple of months…my Plantronics PLT510 headset works great with it. However, the car audio place just talked me into a Kenwood bluetooth stereo, and I just found out that the Pre is NOT COMPATIBLE with it, according to their web site. I have to reboot my Pre in order for the stereo to see & sync with it, and you all know how long THAT takes ~~ what a pain in the a$$!!! And now I’m in love with the BT stereo interface, ugghhhhh!!! Help me, the bluetooth of my pre don’t connect to my laptop with wndows xp professional, THE BLUETOOTH OF THE PRE IS NOT COMPATOBLE WITH WIN XP?? if i connect my pre on my other laptop with windows vista it works correctly. Did you check your XP drivers? I was able to sync my Pre with XP using Belkin’s Bluetooth Software. Still sounds like a driver issue. Go to the Dell site and download the latest driver for your computer. Is your computer is still under warranty, Dell should be able to trouble shoot this further. Otherwise, take a look at the Palm Forum. There is bound to be someone with a similar problem. Are you connecting through Bluetooth as a USB Device? There are a few complaints about that on Amazon, and even Sony’s site says that there may be a compatibility issue with non-Sony devices. Did you try connecting as a “phone”? Did you upgrade to WebOS 1.3.5? It fixed a lot of things. If not, post your problem on the Palm Forum. my palm pre cannot connect with my mac laptop at all. both devices recognize each other, but when it tries connect, there is either an error, or the phone simply mysteriously turns ‘unrecoverable’ again. I wear Oticon Epoq hearing aid which have a bluetooth interface. They have a device called a streamer you wear around your neck which has the microphone, you listen through the hearing aids. They work good as a phone, but sometimes the bluetooth kicks in when there is nothing going on. This causes a tunnel affect in the hearing aids and is very disturbing. Once this starts it keeps doing it constantly. Hope they can fix this. Next Palm update is scheduled for around Feb. 15th. If you have any issues or problems, please be sure to post them to Palm’s Official Forum. I have had my Palm Pre less than a week. When I tried to use bluetooth to set up a connection with my fiance’s phone, my phone crashed. It stayed frozen on the start-up screen for more than half an hour. I called Sprint Tech Support, and they told me I had to take it to a technician. They also said if the tech couldnt fix it, I would have to take it back to the store I bought it from, and pay a $35 restocking fee to get a new one. SERIOUSLY? Their phone is flawed, and they expect me to pay more for a replacement when I already have insurance on it. The continuing Bluetooth problems with the Palm Pre just amaze me. Considering the Palm Treos never had this problem, I would like to know who dropped the ball? With the Pre now on Verizon and soon to be on AT&T, I would hope all Bluetooth problems would be solved once and for all! Im a Palm Pre user from Germany and I have the bluetooth problems of the Palm as well. Now WebOS 1.4.0 arrived in Germany, but many things did not get better. One of the is the bluetooth problem: My SonyEricsson HBH-PV712 loses the bluetooth connection quite often. And there are many other problems like the clock application which is only good enough for estimating the time. I never had a mobile device where the time had to be set serveral times a day! or try to sync the birthdays from the contacts into your calender or Google account. Right, it does not work. The programmers at Palm seem be not really good. The WebOS 1.4 update did again solve my Bluetooth problem. I did hear about the clock issue with the GSM version of the Pre, but that seems to be a problem with the network not the phone. There are a few Apps in the Palm App catalog which will automatically update the phone’s time when an internet connection is available. Palm has done it yet again… another one of their updates has DECREASED the functionality of their device! I have a 2007 BMW 328i that was working perfectly via Bluetooth – 1.4.0 update comes out and it’s no longer working AT ALL. Palm’s official stance is that the 2007 isn’t on their compatibility list. Guess what Palm! YOU won’t be on my compatibility list very much longer if you don’t resolve this… I had it, now I don’t? I’ll be moving to another platform that actually listens to their users and CARES!!! My sentiments exactly Paul. I have a 2007X3 and yes my Palm Pre was working perfectly. I din’t ask for the software upgrade the gave it to me. I spent an hour on the phone with sprint and a hour with Palm to now avail and they seem to have no clue when it will be resolved. I refuse to spend the summer with out my bluethooth. It would of been different if I never had it, but I did and now I don’t. And Yes I will be taking a closer look at Iphone. I just got the Samsung WEP650. It will pair then disconnect and when I rty to reconnect I am informed that the connection cannot be made. I’ve been a Palm user for a decade now but thw upgrade from the PDA to the phone has been fraught with frustration! I’m about to dump the whole thing and move to the i-phone! And Palm or Sprint are of NO HELP. my palm only searches audio device so i cant share my songs and videos with others ……??? I have not used a Palm in a long time. I am now on an Android phone. I do not think you can connect to another Palm device through Bluetooth. But, you may be able to connect through WIFI.